After retiring nearly two years ago, Russell Bobbitt busted out the Bobbitt of old at the 50th running of the 2019 Sumter National Enduro and claimed the overall win at the opening round of the 2019 Kenda AMA National Enduro Series, presented by Moose Racing, in Wedgefield, South Carolina, February 3. Bobbitt’s last win came in 2016. 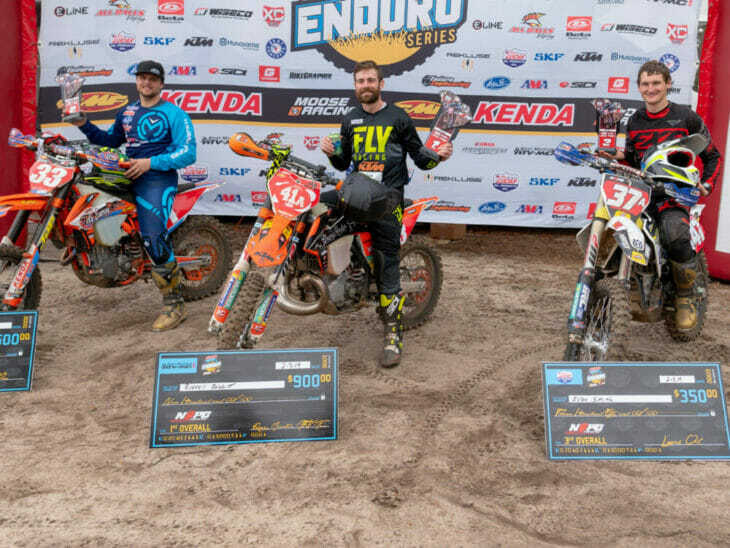 (L-R) Steward Baylor, winner Russell Bobbitt and Evan Smith made up the podium at the Sumter National Enduro in South Carolina. Photo: Shan Moore. The 33-year-old rider from Georgia, Bobbitt, finished 16 seconds ahead of Steward Baylor after the six tests and 64 miles of competition. Bobbitt was on a Gnarly Routes-backed KTM two-stroke. Baylor (Tely Energy Racing KTM) was happy to get second overall after coming into the enduro nursing a bum knee, which he re-injured while practicing earlier in the week. Third overall went to Evan Smith (Husqvarna/Max Motorsports/FXR Racing) who had a shot at second place but lost out to Baylor late in the enduro. Mike Witkowski (Beta USA) and Thorn Devlin (GasGas) rounded out the top five overall. Zack Hayes won the NEPro2 division in seventh overall. Mackenzie Tricker (KTM) won the Women’s Elite class with more than a minute to spare over defending class champion Tayla Jones (Husqvarna). Click here for all the latest National Enduro racing news.